KFKB was the radio station operated by Dr. John Brinkley in Milford, Kansas. 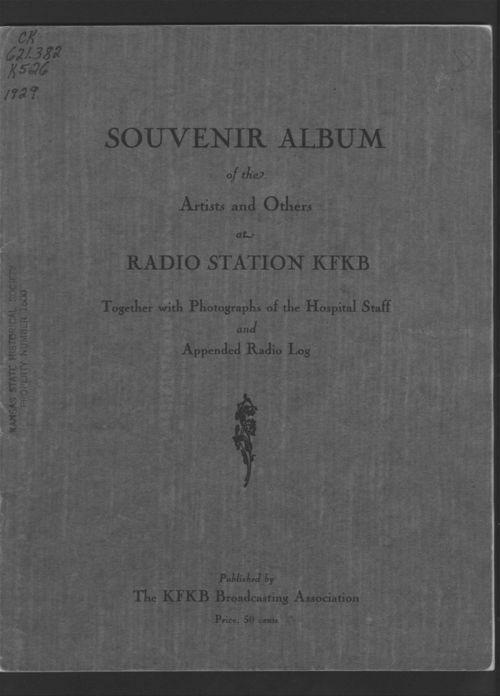 This souvenir booklet contains photographs of Brinkley, the radio station performers and staff, and the staff at the Brinkley Hospital. Radio performers include Bob Larkan and his Music Makers; Steve Love and his orchestra; Arthur Pizinger and his orchestra; Mrs. L. McChesney, the Tell Me a Story Lady; and Uncle Sam McRee, Sr. The souvenir album also has photographs of various members of the musical groups. The daily program schedule for the radio is opposite the title page. The hospital section of the booklet has directions on how to travel to the Brinkley Hospital, photos of the Brinkley family, and individual photos of staff of the hospital with short descriptions of their duties. The album has an excerpt from a Brinkley booklet titled Your Health. The final section of the album is titled "State and City Index with New Waves." It is a listing of various radio stations all over the United States, their call letters and brief technical information. Note: Most of the information is the same as that in the January 1930 souvenir album (KM item # 213222) but some of the photos of staff are different.